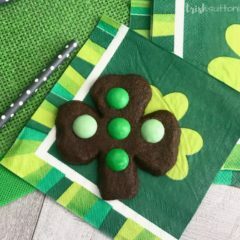 Create festive Chocolate Mint Shamrock Cookies to celebrate St. Patrick’s Day and the month of March with this fun recipe. Begin by adding softened butter and sugars to a mixing bowl then use an electric mixer to beat those ingredients until they are well combined. Add cocoa powder to the bowl then mix. Press the Chocolate Mint Shamrock Cookie dough together in a ball or log shape then place it in a large plastic bag. Chill dough in the refrigerator overnight. After the chocolate dough has had time to chill preheat your oven to 325 degrees then prepare a baking sheet with parchment paper. Next, use a rolling pin to flatten the dough until it is a little more than 1/4 inch thick. I like to place my dough between two sheets of wax paper to roll it; however, flour works too. Use a shamrock shaped cookie cutter to cut out the cookies then place them about 2 inches apart on your prepared baking sheet. The mint M&Ms can be pressed into the cookies before baking or half way through the baking process. If desired, press M&Ms into each cookie then bake for 9-10 minutes. If preferred and to prevent the M&Ms from cracking, bake cookies for 5-6 minutes then press M&Ms into warm cookies and return the pan to the oven for another 4-5 minutes. Allow your Chocolate Mint Shamrock Cookies to rest on the warm baking sheet for 2-3 minutes before transferring them to a cooking rack. Then let the cookies cool completely before serving them or placing them into individual party bags. Enjoy!